The policing team in Bury recently gave a presentation to Councillors on changes the way local policing is being organised. The Police have announced that they are reorganising the rota’s for the Bury Division. The aim is to have more police on the beat, at any one time said Superintendent Paul Walker, District Commander for Bury. Going forwards local policing will be organised into three areas: North, South and Central. (Until recently there had been Bury North and a Bury South team. 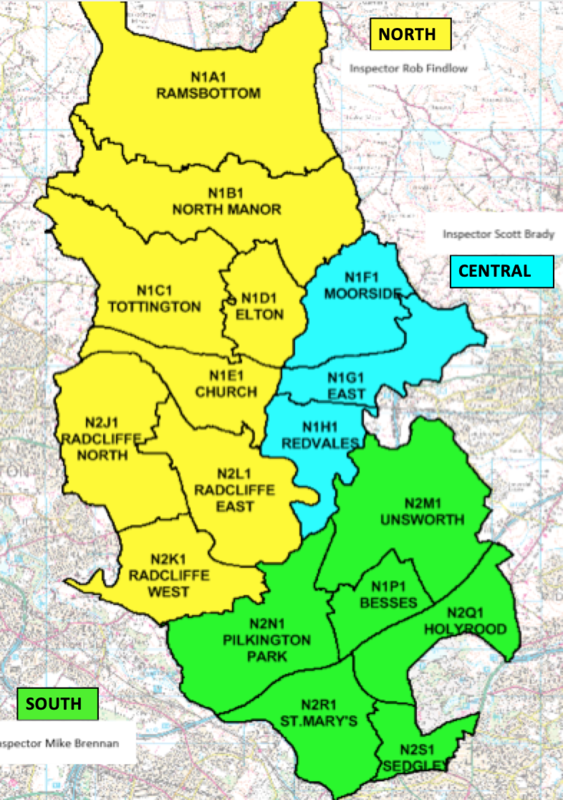 Prestwich and Whitefield will be covered by the Southern area. The southern area will be based at Whitefield Police Station, the other two areas will be based at Bury Police Station. The aim is to keep the police officer’s in there nominated area, as opposed to returning to the station to file reports etc. They will be able to file report remotely. The police provided crime statistics for recent months for each ward in Bury which are here.